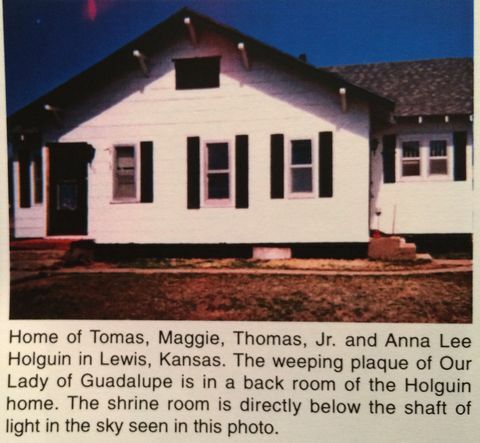 Maggie Holguin was a humble housewife and factory worker, living in a small house in Lewis, Kansas, with her husband, Tomas, and her two young children, Anna Lee, and Thomas Jr. in 1996. Lewis is about 47 miles east of Dodge City. 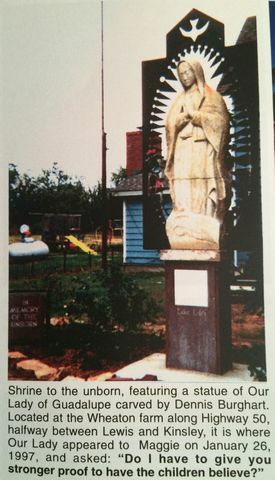 The diocese had been placed under the patroness of Our Lady of Guadalupe due to the majority of people in Dodge City being Hispanic. 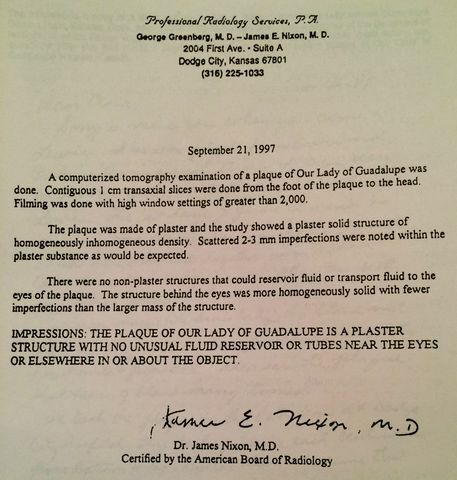 Therefore, it was perfect when Maggie’s sister in Mexico gave Maggie a six-inch plaster plaque of Our Lady of Guadalupe in 1995 which she had possessed since 1989. 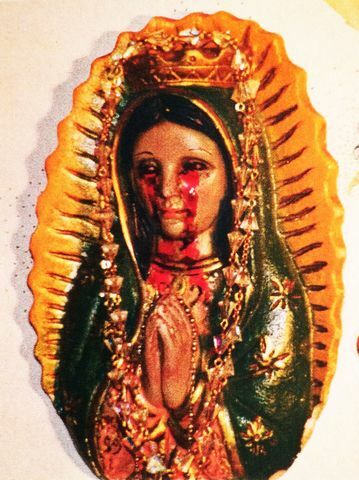 On December 12, 1996 – the 465th anniversary of Our Lady’s miraculous image materializing on Juan Diego’s tilma in Mexico City, Maggie’s plaster plaque began to weep. Just four days earlier, the Diocese of Dodge City had announced that, due to a shortage of priests, it planned to close six parishes by July 1, 1997 and perhaps ten more by 2005. Was this why it started weeping? Maggie had come home from her job at the manufacturing plant at 12:45 a.m. that night. As usual, she switched on a light in the corner of her living room to pray before the plaque of Our Lady of Guadalupe. As she was praying she noticed that tears were flowing from the eyes of Our Lady. She woke her husband and children; they, too, witnessed the plaque weeping off and on until 6:00 a.m. During that next day, a videotape was made that documented two more episodes of weeping at 1:30 p.m. and 5:00 p.m. The first time lasted ten minutes; the second recorded occurrence lasted just five minutes. On December 13, several friends, neighbors, family members, and Maggie’s parish priest, Father William Vogel, were present in the home for an interview with a local newspaper reporter. At 11:00 a.m., while they were all there, the plaque began to weep clear tears. 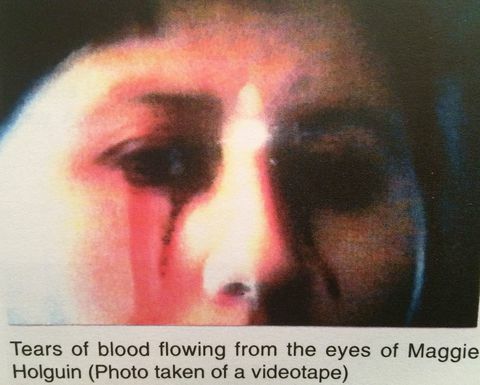 With a video recorder documenting the event, the tears soon turned to a substance that appeared to be thick blood. 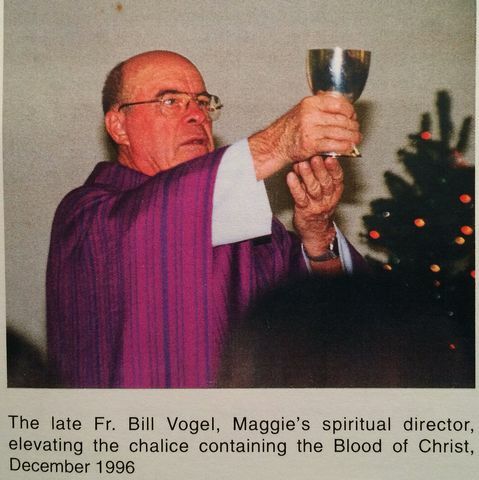 On December 15, Father Vogel of St. Nicholas Catholic Church in Kinsley said that there was “no way to explain the events in a human way.” The Edwards County Sentinel even quoted the United Methodist Church’s minister as saying that these events were real and “messages from God.” The plaque wept again on Christmas morning – and has continued to do so, periodically, at least until 2001. 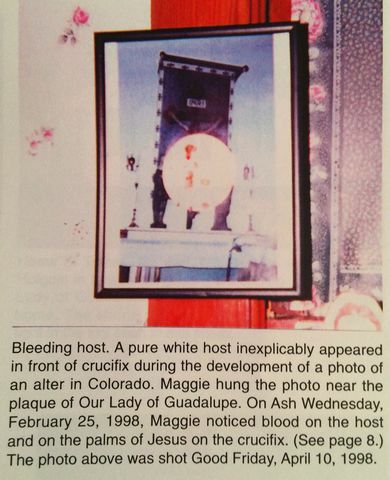 Another surprise happened on December 30, 1996, when Maggie suddenly began receiving messages from Our Lady. After a group in Maggie’s home had just finished praying the Rosary, the group heard Maggie speaking in a different voice that was “very sweet” and using words not normally used by Maggie. Maggie fainted at the end of the messages and did not remember the incident when she woke up. Eyewitness, Matilda Munoz, said that the voice directed those in attendance to help Her save the world with their prayers – to say the Rosary every day, which would help stop abortions and wars. On January 10, 1997, Maggie came home from work early that day because she had had a strong pain in her chest for about five minutes. That night, while saying her prayers in front of the plaque of Our Lady of Guadalupe, a voice called to her. The house filled with the scent of roses. Maggie saw the full body of Our Lady. The Blessed Virgin told Maggie that the pain she had experienced earlier had also been shared by Her as well – because four abortions were taking place at that time. Our Lady shared other messages about stopping the wars and injustices in the world. 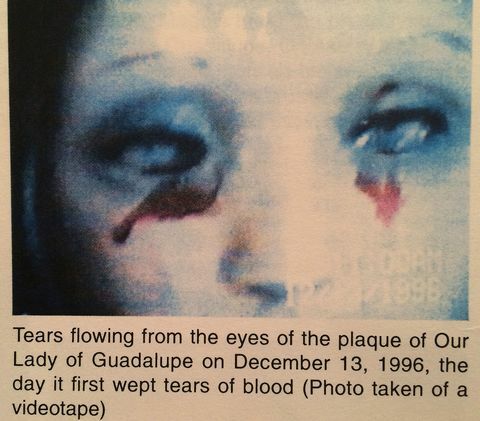 On January 25, 1997, Maggie awoke to find blood under her eyes. With her sister-in-law driving her to the emergency room, Dr. Robert Wray examined Maggie and could find no explanation or medical reason for blood to be coming from her eyes. In fact, Dr. Wray added that in his 35 years of optometry, he had never seen blood in the tears without a resulting laceration or injury. On January 26, 1997, Maggie, her sister, Juana, and their collective four children, were returning from a grocery trip to Kinsley when they witnessed a bright light on the horizon. They lost sight of it until they were about three miles west of Lewis near the farm of Aaron and Denise Wheaton. When they saw the light again, they debated whether to stop or keep going. Although Maggie wanted to stop, Juana didn’t feel comfortable, so she accelerated the car in an attempt to pass through the light. Because Maggie had wanted to stop, she had started to open the car door. The next thing she knew was that she was outside of the car – and without any injuries! Juana had heard a tornadic-type wind and then noticed that Maggie was no longer in the car. Maggie found herself kneeling in front of a row of cedar trees near the highway. Juana turned the car around, and then she and the children joined Maggie near the trees. They all saw the Virgin Mary appear as she stood and held Maggie’s hands while Maggie prayed. Maggie’s daughter, Anna Lee, said that she saw “sparkles” in the hair of Our Lady. The others could not hear the Blessed Virgin, but clearly understood that a conversation was taking place between Our Lady and Maggie. On March 8, 1997, about 50 people – including personnel from two Wichita television stations – were present when Maggie began to spontaneously bleed at 4:50 p.m. from her brow, palms, and backs of her hands. The strong scent of roses filled the air. Maggie carried this strong fragrance in her hair, on her skin, and with the bleeding brow. Two babies present were found to have the scent of roses in their hair as well. On March 28, 1997, the morning of Good Friday, Maggie felt her heart pounding hard while she was doing the dishes. When she pulled her sweatshirt away at the neckline to see her chest, she could see that she was bleeding right over the sternum. Several visitors witnessed this three-inch in diameter area of blood that appeared to form both the face of Jesus and a skull. When Maggie’s husband, Tomas, came home for lunch, he stated that the scent of roses was so strong that it overwhelmed him as he entered the house. She filled Tomas in on what had happened and the messages she had received from Blessed Mary. The stigmata continued throughout the remainder of Holy Week and through Easter Sunday. 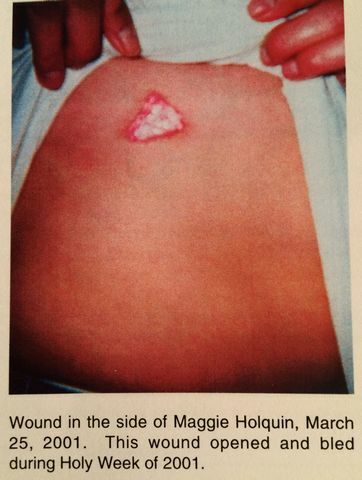 On June 7, 1997, Maggie noticed that her feet were severely swollen and hurting. At 3:00 a.m. she found blood on the tops of her feet. Maggie had now received the wounds of Christ in her feet – having previously had the crown of thorns, wound in her chest, and stigmata in her hands. On June 11, 1997, Maggie received a long message from Our Lady about future events – including how we should prepare for the 72 hours (three days) of darkness. “Go, my little girl. Go tell the world what kinds of things are going to happen. Man does not listen to the commandments that God has given. The devil controls the world and is making people hate each other. They are making weapons that can destroy the world in minutes. Very difficult times will come for the Church. The people will lose faith. God will permit the natural elements (cold, smoke, fire, hail, earthquakes) to slowly destroy the life on earth. The ones who do not believe will die. The ones who believe in Our Father but base their lives on material things will lose millions and their lives in seconds. The ones who survive will wish they were with the dead. God will punish the ones who do not want to believe in Him. The ones who believe and are faithful will survive and believe even more. I am calling on everyone to get closer to My Son. God helps the world, and the ones who do not listen – it will be worse for them. As the mother of Jesus, I tell you to start praying and repenting today. Pray for the conversion of the world because there is not much time left. My little children, believe me, the time is here for everyone to start praying and to repent. Pass the message to your family, friends, and the whole world. We are getting closer to the last days before the catastrophe. The catastrophe will be in the center of the Catholic Church. It will be dead everywhere because of the errors made by the demented and followers of Satan. These men, then – only then, will control the world. In the end, the ones who survive will proclaim God’s name every moment. In His glory they will serve Him like they did before the world became so perverted. Everywhere will be peace, and confidence in ourselves will be back, but the punishment is coming anyway. The 72 hours of darkness will be coming, and it will give life to a new generation of good people. On one cold night, ten minutes before midnight, a large earthquake will shake the whole earth for eight hours. This will be the third signal that God is the Commander of the earth. The ones who proclaim the prophecy need not be afraid. Kneel down and ask God for His mercy. Do not go out and do not let anyone into your house. Only the faithful will not be in the hands of Satan and will survive the catastrophe. On December 8, 1997, the Feast of the Immaculate Conception, the plaque again wept. On December 12, 1997, the one year anniversary of these visitations, more than one hundred people celebrated in prayer and meditation. The plaque was brought in to a Spanish Mass that evening; hundreds came to view the plaque that weekend. On Saturday morning, December 13, Maggie’s home filled with the fragrance of roses while several families were praying with Maggie. The containers that held holy water in the room also smelled and tasted of roses. Maggie began to perspire a mixture of oil and blood from her face. And the plaque wept again the next day while the visiting religious observed. On February 25, 1998, Ash Wednesday, Maggie returned home to find her home filled with the fragrance of roses. When she entered the room where her plaque and shrine were placed, she found drops of blood-tinged stains under the glass of a framed picture that was hanging on the wall next to the plaque. The picture, taken by a woman from Colorado, shows a crucifix on an altar. But a round white Host had appeared mysteriously in front of the body of Christ. On this day, the Host had changed to a rosy color. Spots of blood were clearly seen on it and on the palms of the hands of Jesus. While Maggie was exploring this, the plaque began weeping bloody tears again. Father Vogel was alerted, and when he came to Maggie’s house, he opened the holy water container and discovered the strong fragrance of roses. A family from Oklahoma came to see the plaque and prayed the rosary for a family member in St. Louis who had been bedridden with a heart condition. The next time they talked with him, he described how he had suddenly felt better, could get out of bed, and had been feeling great ever since then. With further questions, they learned that it had been the same exact day and hour as their prayers in front of Our Lady’s plaque. A local girl, who had been severely injured in a car wreck at age two, had suffered a gash in her leg that had required 857 stitches. Four years later, she re-injured the leg, leaving a quarter-size hole that skin grafts failed to close. It remained open for three more years until December 13, 1996, when the girl visited Maggie’s home. The hole in her leg miraculously closed up while they were there. Everyone hailed it as a miracle. Peggy Teddy, a woman from Overland Park, Kansas, was in the final stage of cancer with doctors only giving her one more month to live. Accompanied by her sister and some of her friends, they visited Maggie’s home on Good Friday, April 10, 1998. Peggy recalls smelling roses as she entered the shrine room to pray the rosary with everyone. When Peggy returned home, she started regaining her strength somehow. The tumors in her brain had stopped growing. Her life was spared and their prayers were answered! Samples of blood coming from the plaque and from blood appearing on Maggie were collected and submitted for testing at the Analytic Genetic Testing Center in Denver, Colorado. The DNA matched from the separate samples, immediately suggesting that Maggie’s own blood had been placed on the plaque somehow. But, the opposite is actually more true: The plaque’s supernatural weeping tears were matching the unexplained supernatural appearance of blood on Maggie. Remember that doctors could not find a wound or source for the bleeding on Maggie. And they never drew a blood sample that was clearly taken from Maggie’s body. The DNA results only prove that the two locations of unexplained tears and supernatural bleeding matched – and that none of this blood was seen coming from Maggie nor taken from within her body for analysis. Besides, the plaque has wept in other people’s homes when Maggie was not even present. Most other times there have been groups of witnesses observing copious tears, etc. So, why Lewis, Kansas? Why did the Mother of God choose this location for these appearances and miraculous events? Was it because so many parishes were closing soon due to a lack of available priests? Or was it because Kansas was known at that time as the “abortion capital of the world” – largely due to Dr. George Tiller’s abortion practice in Wichita that accommodated women from all over the world for late-term abortions? Our Lady of Guadalupe is the icon for the Pro-Life movement to stop abortions. Any connection? 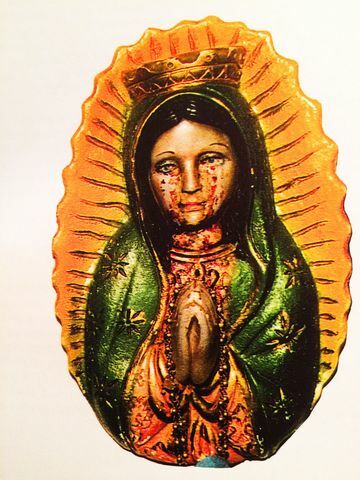 The plaque of Our Lady of Guadalupe still weeps, periodically. On the infamous day of 9-11 (September 11, 2001), the plaque wept tears. Maggie had a heart attack in December of 2001. 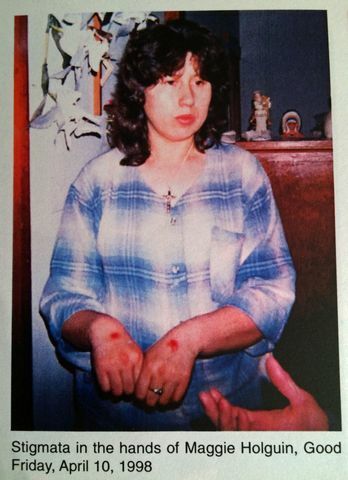 During Lent of 2002, she again suffered from stigmata in her hands and feet and shoulder. Many still report prayers answered as well as miraculous healings.